// remove the file prop and flow will complain! // flow will happily access both file and fileService props! If put esproposal.decorators=ignore into flowconfig, then flow type will ignore all decorator. I think that's the cause. // $FlowFixMe - TODO how define props without "Property `props` is incompatible: InjectedProps. This type is incompatible with Props" ?! I import all our stores in the libdef file. I'm pretty sure your solutions are way smarter than this but I'm I wanted to share my finding, maybe someone else is interested. @Gvozd 's method works for me. It is a positive not to have to write extra code in every component. @coremessage the modification you suggested results in the original flow error about missing injected props again for me. Having a flow ignore comment doesn't seem to bad though. It supports covariant (readonly) props. It supports optional props and defaultProps. You are not required to mark optional any injected props. It allows you to inject only small part of store, not entire store. It has exhaustive type checks. 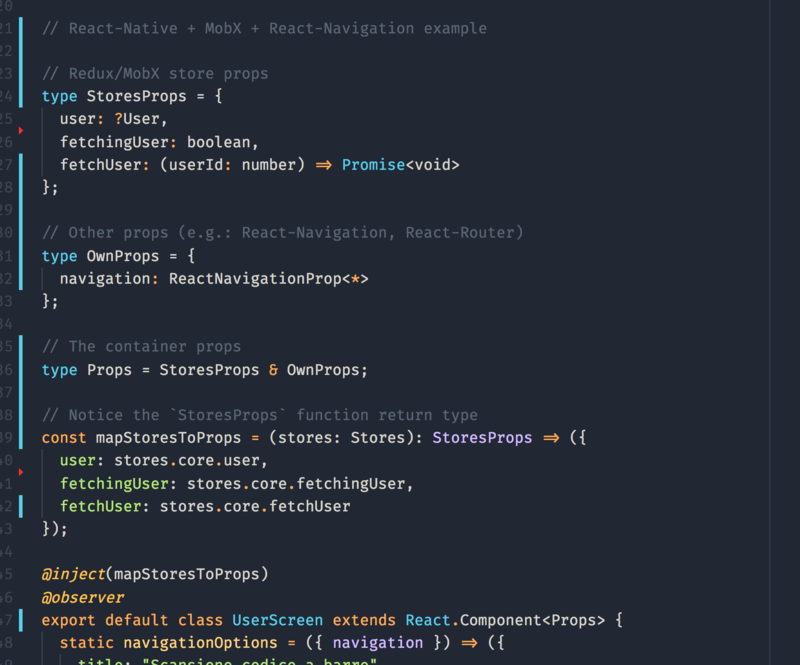 So you can not inject any props that are not defined in component props. You should pass to component all mandatory props that are not injected, not marked optional and not default. You can not pass prop to component that has been already injected. Also you can not pass any props that is not defined in component props.